Written by Janet Choi on February 5, 2016 . [T]he interesting thing was that when the odd condiments were offered in the fancy containers, the coffee drinkers were much more likely to tell us that they liked the coffee a lot, that they would be willing to pay well for it, and that they would recommend that we should start serving this new blend in the cafeteria. When the coffee ambience looked upscale, in other words, the coffee tasted upscale as well. It is the person who designs the environment in which we live in who has the most influence on our decisions as opposed to the person who is actually making the decision. How you communicate with your users is part of their environment. You’re playing a role in designing their decisions beyond the issue of whether they clicked on a link or not. You see, email plays especially well as an environmental element or a component of choice architecture. Because email tends to span a series of multiple interactions, serve as an extension of your product or offering, and feel personal and relevant, you can use it to design experiences. Great experience design provides a notable competitive advantage. In the brick-and-mortar world, that may be the interior design and atmosphere of a space. The ambience that Starbucks deliberately created in their stores, for example, played a vital role in their success. The roasty aroma of fresh ground beans, the earthy colors and smooth music, and menu of fancy Italian-sounding drink names at a time when third places were few and third-wave coffee yet to bloom established Starbucks’s position as a go-to spot. “I’ve always loved the design aspect of Starbucks,” chairman and CEO Howard Schultz writes in his memoir Pour Your Heart Into It. “I consider graphics and store design to be a differentiating factor, a way to show our customers that Starbucks is one step ahead.” Many internet businesses (that aren’t e-commerce) put off or don’t put resources into user communication, beyond occasional announcements and promotions. But what’s going to stand out and keep you steps ahead in this software-eating age is people’s experiences in the environment you create for them — and a core part of that is how you communicate with them. To me, the most significant takeaway from behavioral economics that we can apply to marketing, and email in particular, is to push to be much more creative, empathetic, and intentional when it comes to people’s experiences. 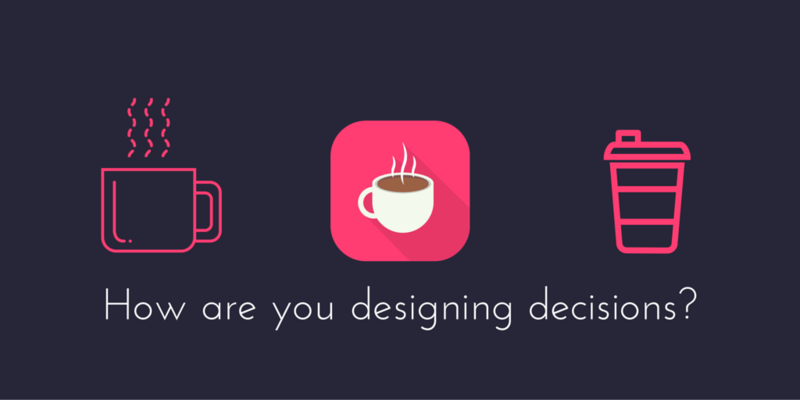 Are we designing decisions, architecting choices, building value, and promoting people’s experiences or merely promoting? Do you have any email success metrics beyond opens and clicks? Share with us in the comments!